Though predominantly a single family residential neighborhood, land use in Montford has been mixed since the earliest days of development. A number of establishments from boarding houses to public schools to a city cemetery have appeared throughout the neighborhood. Several small, private clinics and hospitals for tuberculosis and other ailments were also established. Best known of these was Highland Hospital, originally known as "Dr. Carroll's Sanatorium," founded by Dr. Robert S. Carroll, a distinguished psychiatrist. His program of treatment for mental and nervous disorders and addictions was based on exercise, diet and occupational therapy, and attracted patients from all over the country. The hospital was relocated from downtown Asheville to the northern end of Montford Avenue in 1909, and was officially named Highland Hospital in 1912. 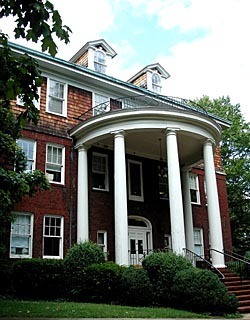 Highland Hall, one of the Colonial Revival buildings built specifically for the Hospital in the early 20th century and Homewood, house of Dr. Carroll and his wife, Grace Potter Carroll. The campus included landscaped grounds for patients to recover through means of "diversion" and "productive occupation." A variety of buildings built in Georgian Colonial, Norman and Arts and Crafts styles housed the patients and the facilities, most of which still stand today including Highland Hall. 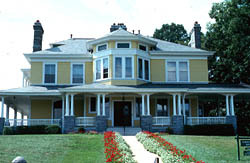 The campus also included Dr. Carroll's home at 19 Zillicoa Street, known as Homewood. Dr. Carroll's wife and world-renowned concert pianist Grace Potter Carroll, ran a music school at their house from which she gave lessons and held performances for many years. Among her students was Nina Simone, a nationally known jazz musician herself. In 1939, Dr. Carroll entrusted the hospital to the Neuropsychiatric Department of Duke University. It was during this time that on the night of March 10, 1948, a deadly fire broke out in the main building and took the lives of nine women. Among the victims was author Zelda Fitzgerald, wife of F. Scott Fitzgerald. Duke owned the property until the 1980s and today the complex functions as an office park and shopping plaza. Highland Hospital is located along Zillicoa St. on the western edge of the Montford Area Historic District. The grounds currently house commercial enterprises; stores are open during normal business hours.